Because the planet Venus circles the sun inside of Earth’s orbit, Venus can never appear opposite the sun in Earth’s sky – like the moon does at full moon. In fact, Venus cannot even get as far as 90 degrees from the sun – as the moon does at its first and last quarter phases. As seen from Earth, Venus stays closely tethered to the sun. These next few evenings, however, will find Venus at the end of its tether, at 46 degrees east of the sun. In astronomical parlance, this is called Venus’ greatest eastern elongation. On the average, Venus sets about 3 hours after sunset during a greatest eastern elongation. However, this is a poor evening elongation for the northern hemisphere, and a good one for the southern hemisphere. That is because Venus stands to the side of the setting sun in our northern skies, yet above it in the southern part of the globe. For instance, at 40 degrees north latitude – the latitude of Boulder, Colorado – Venus sets about one hour and 40 minutes after the sun. Near the Arctic Circle, Venus actually sets with the sun. In contrast, Venus stays out for almost 4 hours after sunset at 40 degrees south latitude. Near the South Pole, Venus is out all night long! 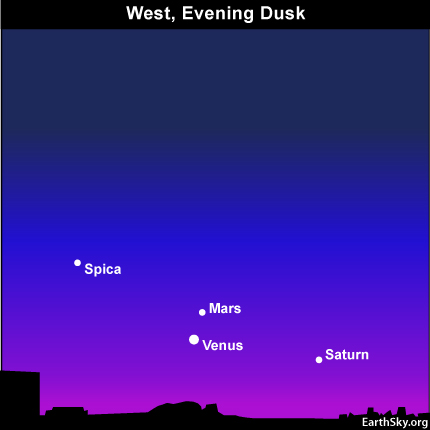 In the northern hemisphere, you may need binoculars to see the planets Saturn and Mars, and the star Spica. Site contents copyright © 2019 Recorder Online	except as noted. All rights reserved. | 88 queries in 2.084 seconds.